Ok, they may seem little to you, but I for one am devastated that my dang chives are refusing to sprout! On February 7th, I planted 5 kinds of peppers, 2 kinds of toms, parsley, cilantro and the chives. Now over a month later, I re-planted more chive seeds on March 22nd…I know it is only the 29th today, but MAN, these suckers better come up soon. I am being totally impatient here I’ll have you know…. hmph…I may have to go out and buy a chive plant next month. 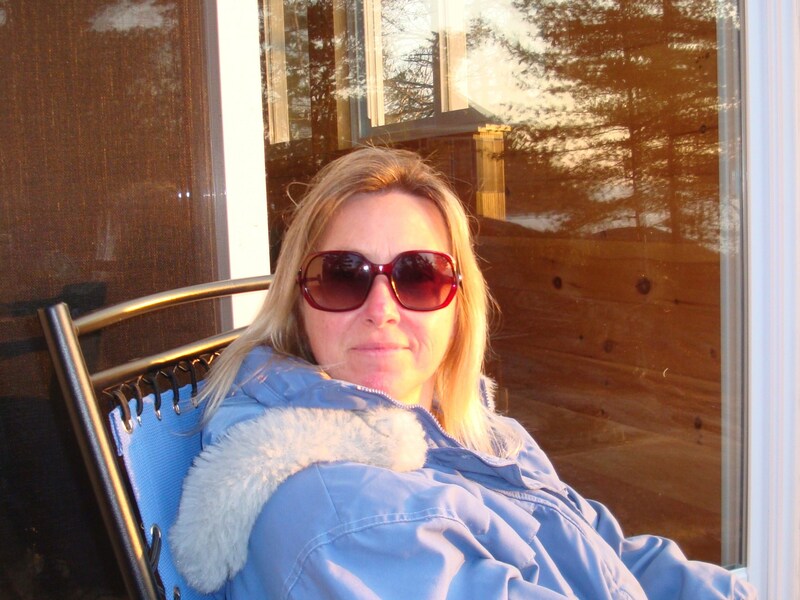 *Update ~ OK….REALLY bummed now! The second set did not sprout, so obviously a dud package of chive seeds. Luckily I had saved some seed pods from my chive plant last year and planted those on April 12th and they FINALLY sprouted on April 20th…at this rate, I’ll have chives in September! Pinching your sweetie’s backsi… oops, I mean.. Pinching BACK your plants! Here in the Greenhouse I call my Living Room, we need to pay a little more attention to our sprouts than we have been. Now that they are growing with gusto, it’s time to make them even healthier and stronger. How to do this you ask? By pinching back new growth (I know, it sounds counter-intuitive, just trust me), to stimulate the plant to grow MORE leaves and to become fuller, you have to ‘pinch’ off (or use scissors) new growth to get MORE new growth…I hope you follow me, don’t get lost, it really is simple, I am living proof that it can be done. 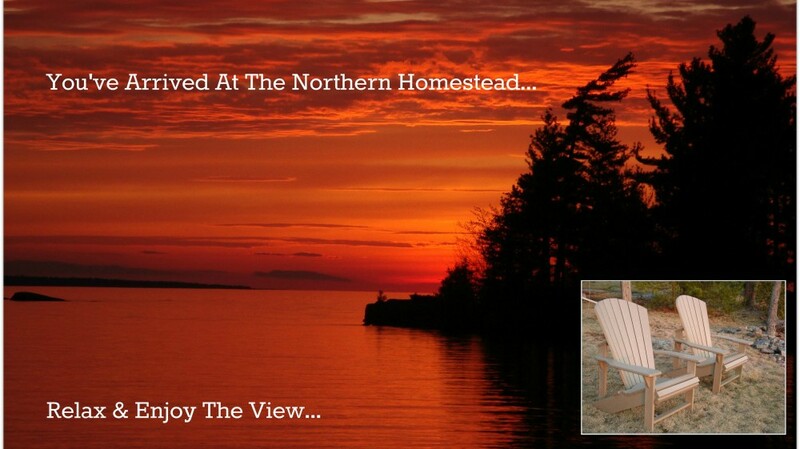 Take at look at the photo below, see where the red arrow is pointing? Take a sharp pair of scissors (no, don’t RUN with them, we must practice safety here in the greenhouse) and snip right above where the new growth is sprouting from the main stem. This will encourage the plant to make new leaf nodes (and more of them) all over the plant. 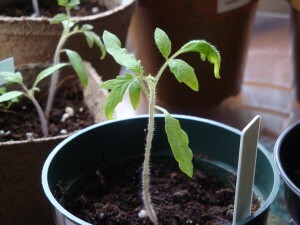 We want bushy plants, with lots of branches that will sprout lots and lots of flowers to get lots and lots of tomatoes (or peppers, or tomatillos, or whatever it is you are growing for food).In a few days, you will see the plant rebound back with new growth, just keep them warm in their sunny locale. Water when the soil starts to dry out and continue to rotate them daily so they grow straight and not leaning toward the sun. No, not the beefy kind! “Stakes” is what is on the menu today. Today is the day I gently…and I mean G-E-N-T-L-Y tie up my tomato plants to wooden stakes so they don’t get top heavy from the weight of all their new leaves and topple over. It is a ‘delicate’ task and there is no rushing this or you end up with uprooted/torn foilage and stems and then you have to start ALL over again with the seed germination! I like to use wooden kebab skewers that are around 12″ to 14″ in length and have a nice sharp pointy end for going down into the soil. Set the skewer beside the plant stem and carefully push down until you reach the bottom. Be EXTRA careful not to damage the roots. Next, using special gardening twine (special in that it is treated as not to rot or fade and break once outside) and gently (like I stated above!) 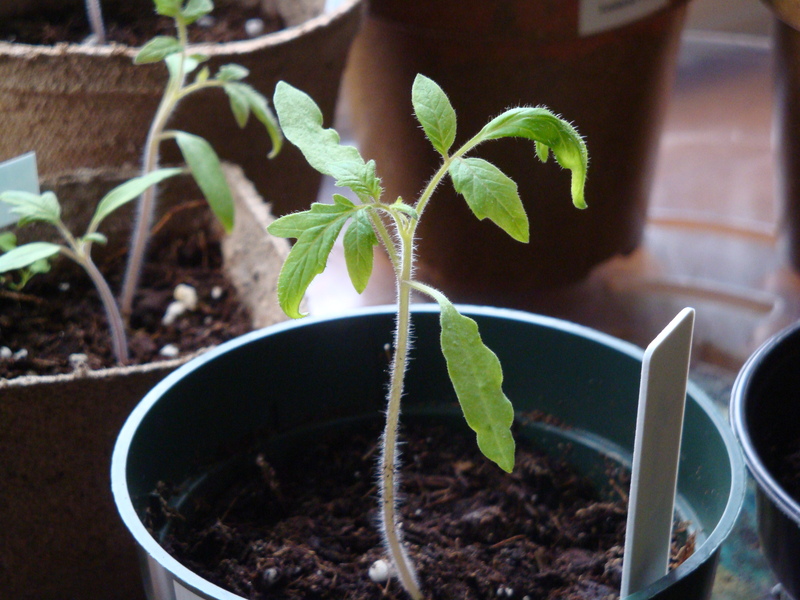 tie your tomato plants to the stakes. 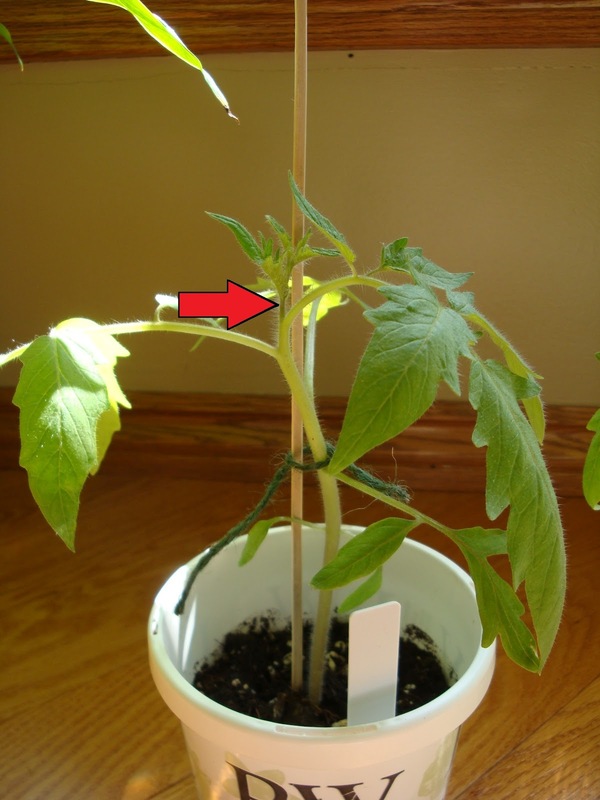 If your plants have grown really tall (like mine), you may need to tie once near the bottom, and again in between the first and second set of leaves. Do NOT tie too tight! They need room to breath and grow in diameter, so make sure you have left plenty of room for them. 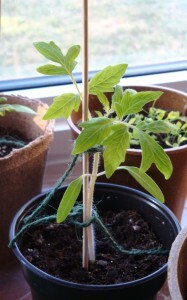 Check on them every other day to ensure the twine doesn’t get too tight against the stems. Loosen as necessary and re-adjust positioning as they grow taller. Then, just keep the soil moist (but not soggy!) and turn them once or twice a day so they grow straight. “Can you eat these Sprouts?” I could just imagine this coming from an inquisitive 6 year old (if I had one around, I don’t though thankfully) pointing a menacing, chubby little finger at the delicate stems of my toms and peppers…. Heck no! I would reply, these sprouts are not for turning into a stir fry for dinner, they are the sprouts of yummy goodness that is to come this summer! I now have an abundance of little green shoots that are almost 4″ high in various little pots crammed onto the ledge in my living room window (think high-density, low-rise town homes) and they are thriving with relatively little attention. Thank goodness I don’t need to babysit them all day, like my kids when they were younger…I can still hear the ‘HE HIT ME’ or ‘SHE’S HOGGING THE TV’ in my head that makes me want to run for the bathroom, lock the door and enjoy a much needed Calgon moment. Instead, they hang around in their peat pots soaking up the warming rays of the sun and all I need to do is occasionally rotate them so they don’t become the leaning tower(s) of Pisa when they should be like the CN Tower or the Space Needle. Keeping the soil ‘moist but not soggy’ while the seeds germinate is truly an exercise in self-control though. I have already drowned some habanero seeds and am now on to batch # 2, let’s see if I can do better this time. Meanwhile, everyone else in my miniature plant world is coming along fine. The tomatoes are growing the fastest, they already have their 3rd set of leaves unfurling with the Poblano peppers not that far behind. The Cilantro and Parsley are doing so well that if I wanted some ‘micro greens’ (culinary term I keep hearing on Iron Chef) I could use them as garnishes for my…ahem…lavish meals ~ hahahaha! But I will wait for them to get bigger, no sense in mowing them down too soon. My chives though are being quite shy and have not poked one teensy stem forth yet and I am worried I may have drowned them too….but on the positive side, my Iceland Poppies have popped out all over so that at least has made me happy. Until then, keep your thumb green and don’t let those little dudes dry out!